Welcome back! If any of you are joining me from my new attempts at spreading the word, like the Comic Blog Elite and Networked Blogs, then I hope you stick around a while! I've been all over the place, but I'm going to try and balance things out from this point (yeah, right). Expect a movie or TV show review once a week, comic-related or not. I also want to keep going with at least one solid op/ed every week. There are also some interviews on the docket, including one I'm transcribing currently where I had words with former Marvel and DC writer/artist/editor, Al Milgrom. (Keep watching, as it's still going to be a few weeks before it's ready. And it will be a multi-part interview.) I'm still hard at work on reviews and other things, so they'll also be coming once a week. Speaking of reviews...away we go! 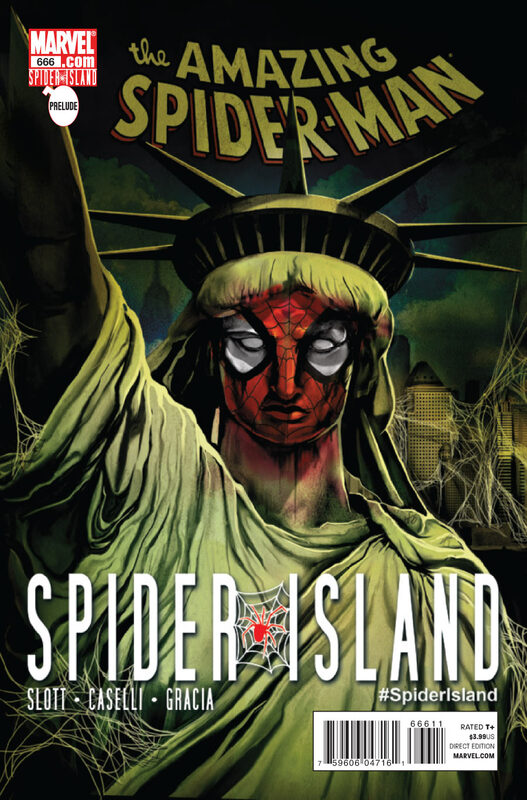 Welcome to Spider-Island, land of one comic with dozens of variant covers highlighting comic specialty shops all over the world! Seriously, though, if this gimmick gets people to pick up this book, that can only be a good thing. After all, since "Big Time" kicked off the post-"Brand New Day" status quo, writer Dan Slott and his artists have been on a roll, providing thrill after thrill. Marvel has successfully updated their flagship character under one man's consistent vision, and after nine months, it's time for Slott & co. to kick the Spider-Mobile into overdrive and see how she maneuvers all the hairpin turns in the big city. Okay, so the Spider-Mobile hasn't really been taken out of mothballs, but "The One and Only," the prelude to the fall event "Spider-Island," is a perpetual motion machine of plot, never dwelling on one particular set of elements longer than it takes to familiarize readers with the status quo of all the saga's players. In short order, Slott adeptly shows us Peter Parker's hectic lifestyle as he flits from one group of friends to another. We meet his girlfriend Carlie, his Aunt May and her husband Jay, his present co-workers at Horizon Labs, his former co-workers at the Daily Bugle, his fellow members of the Avengers and the Future Foundation, and other heroes like Shang-Chi, the new Madame Web, and the Young Allies. Apart from Spidey's travails, we also see the greater supporting cast who will come to play important roles over the next few months, including Flash Thompson, a..k.a. the new Venom; his girlfriend Betty Brant; Mayor J. Jonah Jameson; and, oh yes, the villain of the piece. All the while, Slott teases his audience with pieces of what's been happening around Manhattan in a more expanded view than the last few months of two-page "Infested" segments. The book's biggest strength--the way in which Slott spotlights the entire cast, including villainy--is also the book's biggest weakness. Aside from the overarching "everyone's getting spider-powers" plot, there really isn't a strict narrative to follow. It's all "here's the way things are" with a hint of what's about to happen. That's fine for an introductory segment, and I know the creative team is good for much more in the next outing. The storyline will literally explode into various books within the next four months, and most of them are touched upon here. As with other major events from Marvel and DC, I sincerely hope readers can get enough of the overall picture from just reading Amazing Spider-Man. The idea of New Yorkers gaining spider-powers is delightfully Silver-Agey, and this issue's title makes it clear the team smartly plans to emphasize Peter's loss of uniqueness amid the plague. Slott's on his game in a character-centric issue, and artist Stefano Caselli shows ever more why I've thought he'd be a perfect match for Spidey. How's the Spider-Mobile handle in a city where everyone's gaining spider-powers? Like a dream, Spidey fans, like a dream. I'm not kidding--Buy It. After the chaos that was Shadowland, Matthew Murdock returns to form as Daredevil in this relaunched series by Mark Waid, Paolo Rivera and Marcos Martin. 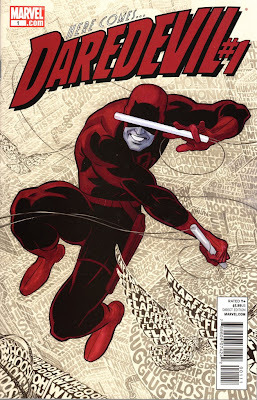 Daredevil has vacillated between different takes over his long history, from the happy-go-lucky, Spider-Man type of early Stan Lee vintage, to the grim-and-gritty hero reinvented by Frank Miller and all points in between. Waid has wisely shoved aside much of the darkness the character's been mired in since Brian Michael Bendis took over and reinstated the "Man Without Fear," even taking a few more steps forward than other writers. Meanwhile, two incredible talents join him for art duties, both of whom are a solid stylistic shift from the previous hundred-odd issues. If anyone was the perfect writer to take over after the likes of Bendis, Ed Brubaker and Andy Diggle, with their Daredevil caught in a perpetual death spiral, Mark Waid would be the most unconventional of picks. At the same time, he has such a definitive grasp of the character and his universe that I can think of no one better, especially when it comes to rebalancing the book's classic elements. Let's face it: ever since the advent of Frank Miller, virtually everyone's tried to re-do or out-do his work, meeting with various degrees of success. Waid uses some basic tenets of Miller's work and his admirers, but also mixes in a liberal dose of the fun that Stan Lee and more recently J. Marc DeMatteis, Karl Kesel and Bob Gale brought to ol' Hornhead. Daredevil has now become a character to roll with life's changes, to be carefree, because life has handed him such despicable things over the years. Is he in denial? Did he finally go off the deep end? Those are the questions, aren't they? As mentioned, Paolo Rivera and Marcos Martin bring an old-school sensibility to the series with their fully-rendered, impeccably textured artwork. Rivera, more commonly seen as a painter, shines in the first story, which showcases one of Daredevil's battles while setting up Matt Murdock's own status. Martin similarly shows his chops on the backup story, a conversation with Matt's friend and partner Foggy. The latter artist has thrilled on Dan Slott's Amazing Spider-Man, so that series' loss is Daredevil's gain. When last we left our red-skinned rampager, several enemy forces had pounced on him, from M.O.D.O.K. to Zero/One to Black Fog. They were joined by the newest threat: Angrir, Breaker of Souls, better known as the Future Foundation's Thing, transformed by the power of a mystical hammer summoned by the Serpent, chief architect of this summer's Marvel event, Fear Itself. This issue continues along the timeline established in Brian Michael Bendis' Avengers #14, adding spice to the proceedings and de-emphasizing Red Hulk in favor of a spotlight upon his rogues against the backdrop of the larger event. Writer Jeff Parker again shows his skill at fleshing out the Red Hulk's villains. 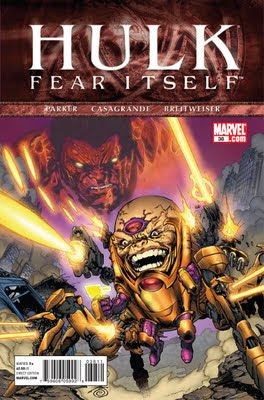 This time, with the Red Hulk out of the picture, he employs the new M.O.D.O.K. as protagonist and sets the issue's conflict between him and Zero/One, even as the Serpent's army closes in. It's a tough balancing act--after all, the name of the book is Hulk--but with the title character minimally involved, Parker is able to emphasize their similarities and differences. He especially does well at remarking that Zero/One is not quite as far removed from humanity as she claims. I continue to be impressed by artist Elena Casagrande. She does have a pleasing style, although I'm not sure if I'm only seeing the similarities to Gabriel Hardman due to colorists Breitweiser and Charalampidis teaming with her. Whatever the case, her M.O.D.O.K. and Black Fog are frightening, her Zero/One is appropriately cold, and her Red Hulk and Angrir are powerful as long as they are on-panel. Overall I remain quite impressed by Jeff Parker's Hulk, as even in this two-issue Fear Itself tie-in, the writer keeps eyes focused on the ongoing plotline involving the various villains, only using the event as a frame. It's odd that the story ends without the Red Hulk facing his enemies here, instead, I believe, dovetailing back into the final few issues of the main Fear Itself book. At least we can rest easy knowing next issue will herald the arrival of the Omegex and the covergence of several plotlines that have built since Parker and Hardman's first issue. For now, Hulk #38 is a solid read and that's what I suggest you do--Read It.